Congratulations to Neil Jefferis who claimed his third Player of The Year title. Neil had a very consistent season which included a memorable victory in the Teams event. Coming into the Kent County Cup Neil had a 15 point lead over his nearest rival, but Lee Martin wasn't taking part in this competition so Neil knew a reasonable run would see him collect the prize. Andy Soper's entry in the Cup saw him sneak into the runner-up spot for the second year running. As many of you know, Neil takes part in many of our events and is deserved champion and a terrific ambassador for snooker in our County. Defending champion Jimmy opened his account against newcomer Nicky by taking the first frame 66-45. The second frame started off tightly but with only a few reds left Jimmy found his range and prevailed 71-38. Nicky remained focused and determined but found Dylan in confident form winning the first frame 70-15. Dylan was in no mood to give Nicky any unearned chances - at one stage Nicky found himself negotiating 3 consecutive snookers. Dylan pressed home his advantage scoring 78 to Nicky’s 30. Dylan made an emphatic start running away with the first frame 80-27. The second was a much closer affair. Jimmy and Dylan treated the spectators to some excellent safety play and inspired potting. Leading by just 5 points, Dylan needed the final black to take the title. Dylan potted the black under pressure but was unlucky to see the cueball follow through into the same pocket, handing the frame to Jimmy 54-52. Neither player held back in the decider. Another close contest keeping everyone on the edge of their seats. Both players had their chances before Dylan held his nerve winning frame and title on the final pink. Many congratulations to Dylan for becoming Kent U16 Champion for the first time at just 11 years old and for achieving his first ever tournament win. We hope we’ll see all three players again in the U21 championship when the new season starts in October. A field of 50 players turned up to compete for our Kent County Cup at Northdown Snooker Club, our only Pro-Am event that invites players from outside of the County to take part. The entry list was bolstered by news that Tom (owner of the club) had organised the recovering of many of the 14 tables, and what a difference it made! Returning champion Zak Surety was back to give it another go, one of six players non-Kent residents in the draw including Paul Ives who came down from High Wycombe and former champion John Parkin from Essex. Paul played well before being knocked out by Kent's Matt Morgan who in turn lost to last year's runner up, Steve Crowley. John however met his match in the quarters against fellow team mate Zak who really was making short work of many of his opponents throughout the day. Surety then went on to knock out Crowley three zip to put himself in the second consecutive final and making a brilliant 88 break along the way. 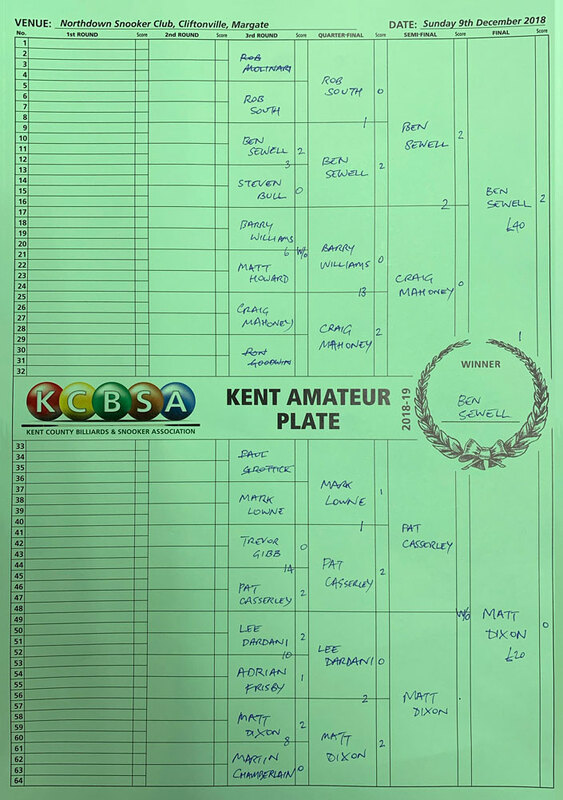 In the top half of the draw, Kent Amateur Runner Up, Ben Trowell was once again proving good form until becoming unstuck against local lad, Lee Richmond who was exceptional all day. Former winner, Mark Cackett was once again racing through his opponents until he came up against our very own Neil Jefferis who somehow knew how to take the wind out Mark's sails and seal victory and put himself in the final for the first time in 18 years. The final was, as it was for pretty much most of Zak's games, a one sided affair as he proved why he was the best in show thwarting Neil's opportunity to get his name on the Cup for the first time. He sealed victory and regained his crown with a faultless three nil triumph, in fact he managed to win the whole tournament without dropping a frame! The Essex man took home £300 for the win plus £10 for the highest break of the day. The Plate competition for the first game losers, ran in parallel to the main event. Stuart Wood completed a very satisfying win over former Kent player, Danny Bush. A great final and the Hartley CC player prevailed to win his very first Kent singles title, we're sure if he hits form next year in our big events he will lift yet more silverware. A great turnout of 13 teams, excellent hosts at Welling club and I'm sure that there will be a few people surprised to read that the Committee finished up winning! Neil Jefferis, Finlay Palmer and Adrian Frisby were 3 down in the first round against Two Beards and a Stubble and came back to win 5-4. Rob South will be talking about the fluked final pink against him for a while too. 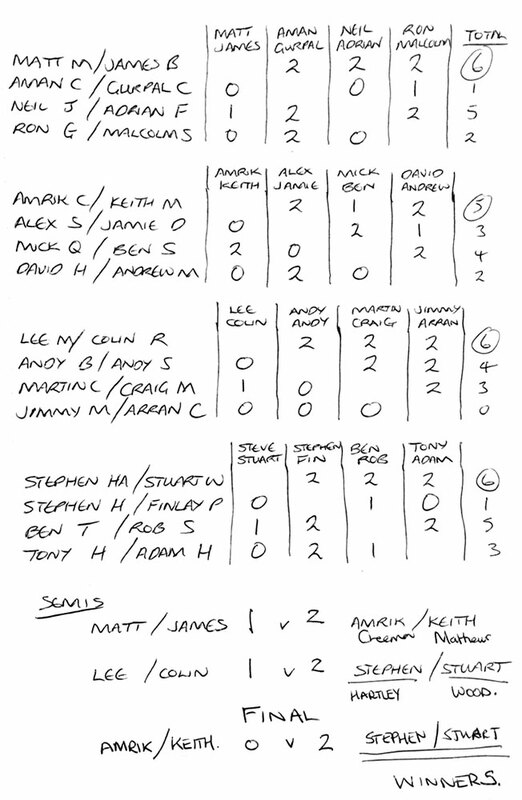 We were then 4-2 down against the Home team from Welling club and managed to win the last 3 frames. The competition then reverted back to it's traditional format of just two frames per player for the semi-finals and final. We finished 3-3 against Folkestone but won the single frame playoff with a little help from a fluke on the last red. We then finished 3-3 in the final too against Stephen Hartley, Keith Matthews and Stuart Wood and won another single frame decider to take the title. An extraordinary result for the team who are more surprised than anyone. We had 16 pairs today, the same number as last year so we ran a Round Robin again with 4 pairs in each group. Matt Morgan and James Burrows finished top of Group 1 winning all three of their matches. Lee Martin and Colin Randall did the same to finish top of Group 3 with Lee making breaks of 80 and 109 on the way. Stephen Hartley and Stuart Wood were also unbeaten in Group 4 although they did have a scare against Ben Trowell and Rob South just scrapping through 2-1. Group 2 was close too with each pair winning at least one match. Mick Quinnell and Ben Sizer won two matches including a 2-1 win over Amrik Cheema and Keith Matthews but because they lost 2-0 to Alex Swatton and Jamie Dunlop it was Amrik and Keith who progressed to the semi-finals. Both semi-finals were very close and went to deciding frames. Lee and Colin had been 1-0 up but Stephen and Stuart fought back and pinched the match 2-1. Matt and James were 26 points up in the decider with just the colours left but they couldn't get that extra ball required and Amrik held his nerve and cleared up to the black and then forced a safety error giving Keith the glory of potting the black to win. The final was a good quality game. Stephen made a 59 break which was good enough to win the first frame. He then started with a 41 in the next but Amrik hit back with a 42 and looked like he was going to get plenty until he clipped the pink when trying to pot a red that was tight to the pink. The momentum shifted back to Stephen and Stuart and they soon won the frame, taking the match 2-0 and the £160 first prize. Amrik and Keith got £80 for their efforts. Thanks to Liam and Graham for being excellent hosts again at the Victoria Club. They are running a competition of their own on Sunday 27th January where the winner will get to play a frame against Mark Williams in his exhibition night on 1st March. Entries are limited to 32 players so contact the club if you want to enter. 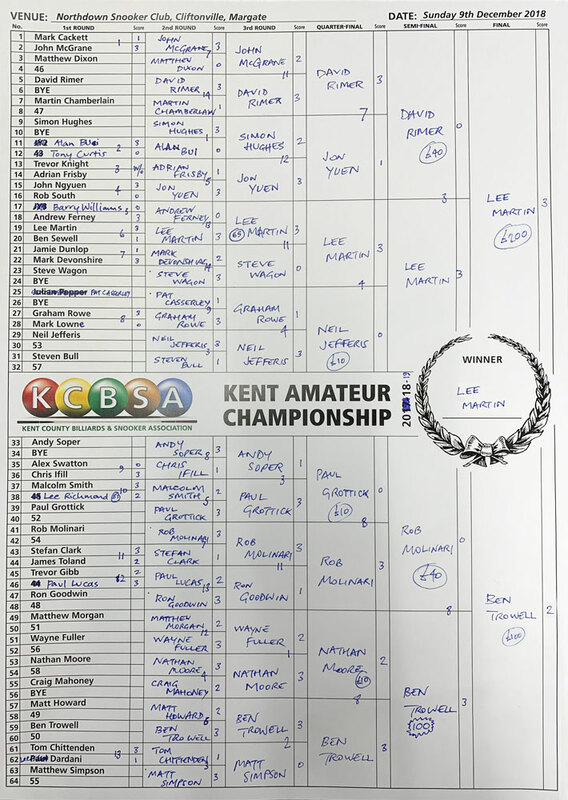 We had 45 entries in the Kent Amateur Championship this year. Returning champion Lee Martin was present to defend his title. The final eight saw David Rimer beat Jon Yuen and Lee Martin beat Neil Jefferis in the top half. In the bottom half Rob Molinari beat Paul Grottick and the in-form Ben Trowell managed to sneak past Nathan Moore 3-2. In the semi-finals Lee Martin ran away victor over Rimer three nil whilst Trowell pulled off the same result against Molinari which included his first ever competitive century break in the final frame. In the final Ben (Medway League's second best player) Trowell took on defending champion Lee. Trowell managed to steal the first before Martin won frames two and three with breaks of 56 and 55. Ben won the fourth with a 48 to level the match but it was Lee who took the honours winning the decider in a scrappy frames where nearly all the balls ended up in baulk. Well done Mr Martin for retaining your crown but congratulations must go to Ben for a brilliant effort throughout the day. The Plate competition for the first game losers, ran in parallel to the main event. Ben Sewell domainated this event winning every match two nil. Matt Dixon played very well to get the final and he will certainly be hoping to do well again next year in the main event. We had 9 entries today so we split into 3 groups of 3 for the Round Robin. Each match was played over an hour with the group winners plus the highest scoring group runner-up qualifying for the semi-finals. All 3 players in group 1 won one frame and lost one frame so it came down to total points scored and it was Craig Mahoney with 425 points that topped the group. Andy Phillips won both of his group matches as did Neil Jefferis in group 3. The fourth semi-final spot went to Will Willard who, despite losing his match against Andy managed to score 509 points in his two matches, more than anyone else. He managed an impressive 345 points in one hour in his victory over Trevor Gibb. Will continued his high scoring play in the semi-final beating Craig by 294 to 183 and Andy beat Neil 175 to 125. So the final was to be a rematch of a group stage match between Andy and Will. Andy started well scoring 20 plus breaks with his first two visits and looked as though he was going to control the match with Will looking out of sorts at first. Will started to settle down though and gradually pulled back level and then breaks of 44 and 34 in quick succession gave him a good lead which he maintained to the end, winning 256 to 181. Will was by far the highest scoring player all day and thoroughly deserved his first Kent title and his £100 prize. Congratulations Will. We had 4 players today in the Under 21s, James Addison-May, Jimmy Matthews, Brandon Nguyen and five time reigning champion Ben Sizer. Ben won all of his games in the round robin stage. James managed wins over Jimmy and Brandon and although he lost 2-1 to Ben, that was good enough to get through and have another crack at him in the final. Yet again it was Ben who produced some clinical snooker to dispatch James 3-0 and win the title for the sixth consecutive year, a remarkable achievement. So another competitve era in the history of our Under 21s has come to an end as both James and Ben will be too old to play in the competition next year, at least it will open the door for a new generation of players to form their own rivalries. We had 10 entries for the veterans today. We decided to run a knockout tournament with each match best of five frames but with the deciding frame just as a respotted black shootout. Clive Underhill came through the top half of the draw with victories over defending champion Andy Soper, Tony Holdstock and then a final black ball against Kevin Dixon. Clive made several good clearances at key points in his matches and thoroughly deserved his place in the final. In the bottom half Malcolm Smith beat Brian Packham in another black ball shootout and then had a convincing 3-0 win over Mick Mehmet to earn his spot in the final for the second year running. Malcolm started the final the best winning the first frame but Clive fought back to take the second on the black. Both players decided to make the next frame the decider. Clive started best this time building a quick 30 point lead and he kept that lead going into the colours. Malcolm tried hard for the two snookers he needed but it wasn't to be and Clive came through, winning the title for the first time and claiming the £70 winners prize.